Senior, Grant Schlichting, recently found out that getting accepted into the Air Force Academy is an epic journey. 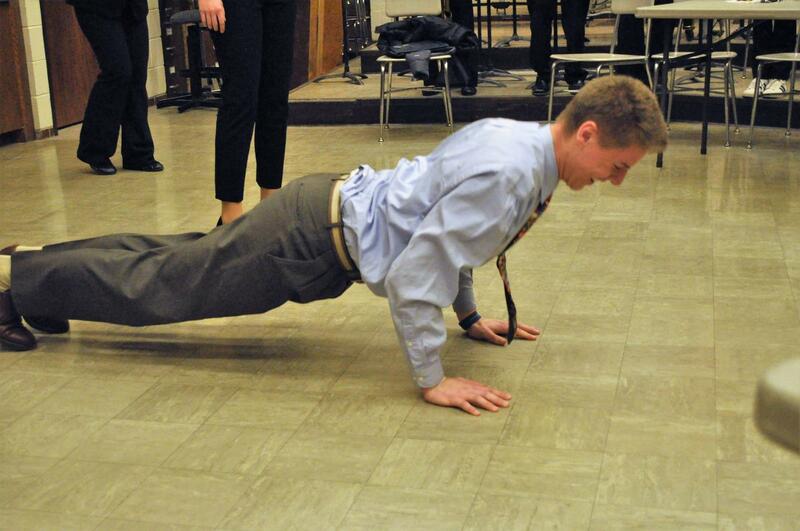 Schlichting does push ups to warm up for a speech tournament. When they grow up, most little kids want to be an astronaut, a police officer, or a baseball player. Some of these kids follow through with their young dreams, but many change their paths as they learn, and grow. Grant Schlichting was one of the few who just knew from the beginning. There was no doubt in his mind that joining the Air Force was the path he wanted to take. Everyone that is close to him was so thrilled about his acceptance. He states “I received a letter through my online portal in Physics class, which read, ‘Congratulations on your appointment to the class of 2022!’” His class was very ecstatic and supportive by cheering and clapping when he announced the acceptance. Even though Schlichting always knew that he wanted to be in the Air Force his ambition really skyrocketed his sophomore year. It soon became his passion. One of the biggest reasons he was so driven was his mother. Schlichting’s mom was in the Air Force National Guard for seven years. When he was little, he always saw pictures of his mom in her formal uniform, and these photos guided Schlichting’s dream. Once he figured out his future, he took it into his own hands to get accepted. The process of getting accepted was long and tough. Schlichting had to have a secure nomination through either a congressman, senator, or the vice president. He also had to have five letters of recommendation, three writing prompts, and an interview. “I received a nomination from Congressman Lewis and Senator Klobuchar, which I was very thankful for,” mentioned Grant.